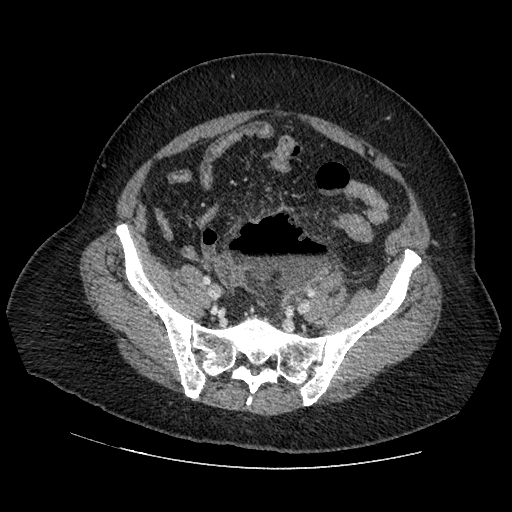 This patient has an 8cm abscess from perforated diverticulitis. In the center of the image you can see a large air and fluid filled cavity with surrounding fat stranding. This is consistent with an intraperitoneal abscess. In middle-aged and elderly patients diverticulitis is a very common cause of intraabdominal abscess. Other causes include perforated appendicitis, post-surgical infection, inflammatory bowel disease, surgical site anastomotic leak, perforated peptic ulcer, gangrenous cholecystitis, mesenteric ischemia with perforation, and pancreatic abscess. Radiology usually likes oral contrast if you suspect an intraabominal abscess because it helps distinguish abscess cavities from surrounding loops of bowel. If you are studying abscesses in soft tissues or organs such as the liver, oral contrast is unnecessary.